The ability to convert d-galactose into d-tagatose was compared among a number of bacterial l-arabinose isomerases (araA). 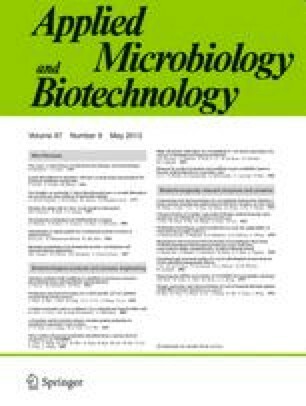 One of the most efficient enzymes, from the anaerobic thermophilic bacterium Thermoanaerobacter mathranii, was produced heterologously in Escherichia coli and characterised. Amino acid sequence comparisons indicated that this enzyme is only distantly related to the group of previously known araA sequences in which the sequence similarity is evident. The substrate specificity and the Michaelis–Menten constants of the enzyme determined with l-arabinose, d-galactose and d-fucose also indicated that this enzyme is an unusual, versatile l-arabinose isomerase which is able to isomerise structurally related sugars. The enzyme was immobilised and used for production of d-tagatose at 65 °C. Starting from a 30% solution of d-galactose, the yield of d-tagatose was 42% and no sugars other than d-tagatose and d-galactose were detected. Direct conversion of lactose to d-tagatose in a single reactor was demonstrated using a thermostable β-galactosidase together with the thermostable l-arabinose isomerase. The two enzymes were also successfully combined with a commercially available glucose isomerase for conversion of lactose into a sweetening mixture comprising lactose, glucose, galactose, fructose and tagatose. This work was supported by the Danish Ministry of Science, Technology and Development. We thank Bente Smith, Britt G. Olsen and Krisztina Faludi for skilful technical assistance, Robert P. Mortlock for generously providing a sample of A. aerogenes strain PRL-R3, Sven Pedersen for valuable advice, Qunxin She for generously providing a sample of purified DNA from Sulfolobus solfataricus and Rachel Kahn for critically reading the manuscript.